Just how much does U of H cost for tuition at this time, and how much is tuition expected to change? How do these charges contrast with other schools? Keep reading to find out. How Much Will Tuition Rise? Get a better idea of the tuition and fees charged by University of Houston so that you can plan effectively for 4-6 years. 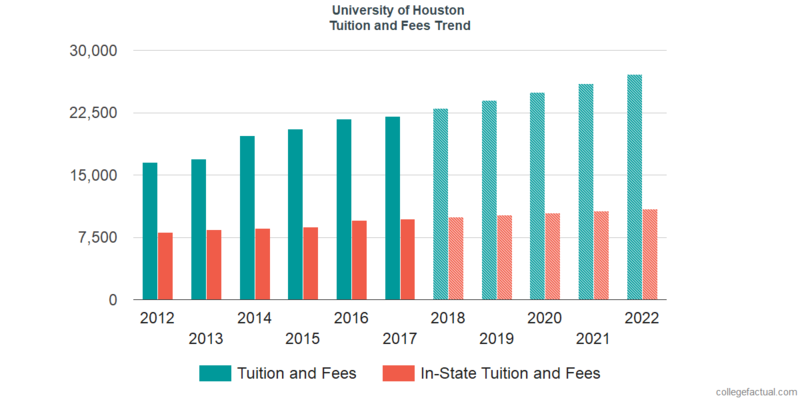 Examine the stats following to know how University of Houston's cost measures up to other colleges and universities and if you should plan for tuition increases. For nationwide, regional and statewide comparisons, view the table below to see how U of H measures up to other schools. U of H tuition and fees is dramatically reduced for students living in Texas. For in-state students, tuition and fees is set at $9,706 for the 2017 - 2018 year, 56.0% off the price charged to out-of-state students. Tuition is $8,724 and fees $982. U of H out-of-state students paid $22,066 in fees and tuition in 2017 - 2018. $982 was for fees, and $21,084 was charged for tuition. The next table outlines the costs defined above for the 2017 - 2018 school year. How much does U of H cost per credit hour? View U of H cost per credit hour here. University of Houston tuition and fees for out-of-state students grew at a standard yearly rate of 4.2% within the last 5 years. In the same time period, tuition grew by 4.4% and fees grew by 0.0%. Based on this, we estimate the cost of tuition and fees this year will total $22,991. For a two-year degree, we estimate tuition and fees will be $46,944 and $97,905 for a four-year degree. This does not cover additional charges including room and board, books, and transportation. Take a look at this next chart to find out how U of H fees and tuition may develop including residency based discounts in the future. Be aware of how much college fees and tuition is rising annually. At a lot of schools students will end up paying a greater price for their final year of college than they did for their first. Discover our answers to common questions and additional information about college tuition and fees.